Once the request has been approved by a Relay Site Admin or a Relay Caption Admin, users with access to the 3Play Media account system can log in to their account and order Audio Description. IMPORTANT: Please refrain from ordering Extended Audio Description for TechSmith Relay assets. Only the Standard Audio Description service type should be ordered. TechSmith Relay offers native support for Audio Description. Follow the steps below to download the Audio Description and add it to a video on your Relay site. Locate the file associated with your Relay video asset and download the MP3 of the Audio Description from the AD Only Media Assets section of the download menu. 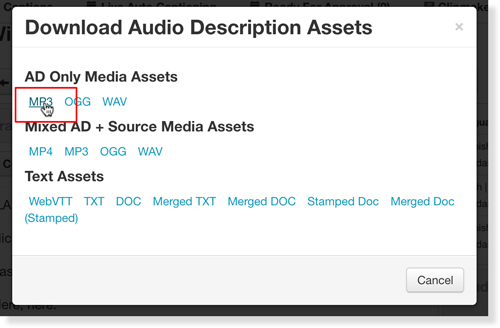 See more information on how to download Audio Description assets from a 3Play Media file. Navigate to the Media section in My Library within your TechSmith Relay site and click the video associated with the Audio Description. From the video page, click the Accessibility button located directly below the video. Click Select an Action and from the drop-down menu that appears select Manage Audio Description. Next click Confirm. Drag and drop the MP3 that was downloaded in step 1 to the designated area on the Upload Audio Description dialog box. Once the Audio Description track processes it will become readily available for viewers.